Last week was an emotional moment. Having prepared fervently so many years for my son to be enlisted, I was totally unprepared for the emotions flooding me on the actual enlistment day. Oftentimes mixed, the overriding mood was one of pride. Pride that my son has willingly submitted to the mandatory duty of military service imposed on each and every male citizen of this island country. 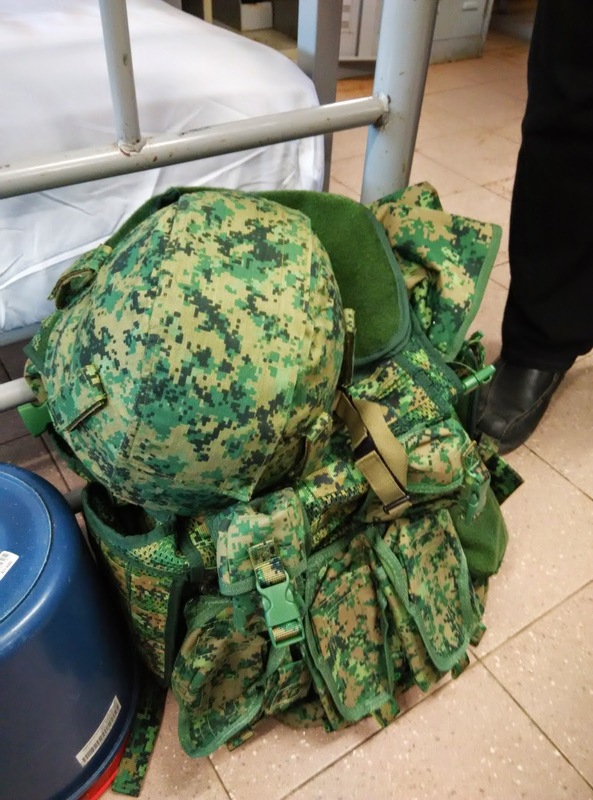 Compared to armed forces in the West, the Singapore government does not give young males a choice when it comes to enlistment. By law, every male citizen has to serve. Period. Honestly, if given a choice, I would rather not have two years taken away from my son like that. Very few parents would like their sons to be exposed to military situations. There is no such thing as no risk. Conscription is not something people take kindly to, especially in Western-style democracy and free society. In fact, when he goes on National Service, it seems like my entire family is doing an indirect form of National Service. My job gets interrupted. Our family gets separated. Everyone's lifestyle gets affected in some way, some more, others less. The only thing for us is to pray and to support our son as much as possible. Like many parents, we too are concerned about safety matters. With tough training regimen and demanding physical exercises, the handling of live firearms, plus occasional stories of accidents happening inside the camp, only the nightly phone calls back home bring some forms of relief. During this time, it is much easier to simply bury ourselves in work. Such a strategy lets busyness become a lid to check emotions. I took some time to reflect upon the whole week. A key point: Choices affect us more than we think. Every choice has consequences. Whether we like it or not, there are rewards for good choices and penalties for bad. Some choices are mistakes we enjoy now but regret later. Others are unpleasant initially but rewarding eventually. In this case, life is not totally free for us to choose. Children don't get to choose their parents. Some don't even get to choose their schools. Parents who move from job to job, city to city, are usually the triggers for great family transitions. When our family left Singapore for Vancouver more than ten years ago, our children's education were also affected. The difference however, was quite pleasant. They enjoyed the education in Canada much more than the Singapore style. The difference in educational philosophy was stark. One believed in homework, regular exams, and a relatively rigid curriculum. The other preferred minimal homework, very few exams, and a flexible curriculum. In Singapore, my kids dreaded school. In Canada, it was completely reversed. My wife and I were surprised to see our kids running to the school with glee. Having said that, the choice to leave for my theological education would carry ramifications for many years to come. Here is the crux of the matter. Everything in life is a choice. There is no such thing as no choice. Deciding what to eat or wear, where to go or what to do are everyday choices. Career-wise, keeping the status quo is a choice. Not making a choice is already a choice. The reality of life is that choices are either made for us or by us. That said, while external choices are sometimes imposed on us, we can still control how we respond to it. A rude driver cuts into our lane unexpectedly and illegally. We can choose to fight back or we can choose to brake and drive defensively. We can choose to hit back in anger or we can choose to keep our wrath in check and to ensure our passengers are ok. In difficult job situations, sometimes we do not have the choice about projects. In tough job environments, just having a project to work on is already something to be happy about. Bosses may decide to give us something or nothing to do. Others dump everything on our shoulders expecting us to comply if we want to keep our jobs. Marriage is also a choice. We choose who to go out with when we are young. We choose one another. In cultures where matchmaking is common, the choice of spouses are left to some experienced individuals. Having children is also a choice. Some have just one, others two, a few more than three. With children comes added responsibilities and financial commitments. Life simply gets more complicated, especially if we allow ourselves to be drawn in by the rat race and non-stop comparisons and competitions around us. Over the weekend, I was shocked to learn about exam papers on sale for children at a Kindergarten level! Some parents are so anxious for their children to get a head start that they make children at a K2 level prepare for exams. Play time is increasingly a luxury to have in Singapore. What's next? Shakespeare for toddlers? Life is a choice we make, and the most important choices are often internal than external. We can choose to be angry or to be sad. We can choose to be kind or to be rude. We can choose how to respond or to react. The more we know ourselves, our temperaments, and our trigger points, the better for us and the people around us. If choices are something we make daily, it no longer becomes a binary CHOOSE/CHOOSE-NOT option. It becomes choosing well. Jesus chooses not to pander to the wishes of his disciples, but to follow on the prompting of God to stay incognito, and enter Judea later secretly without fanfare and unnecessary attention. At the Feast of Tabernacles, we realize the wisdom of Jesus' choice. People in Judea were already looking out for Jesus to stir controversy. Jesus was looking to teach and to reveal more of God to the people, especially to those who want to hear him. When asked about how Jesus learned so much from God, Jesus had this to say: "If anyone chooses to do God's will, he will find out whether my teaching comes from God or whether I speak on my own." He literally turns the matter on its own head by telling the people to seek God constantly, to check the Scriptures diligently, and to discern spiritual teachings actively. The grammar in Greek for "will find out" can also be translated as "will come to know." With the desire to do God's will as foremost, everything else falls in place in the seeking, in the searching, and in the finding. In God's time, we will understand whether our choices are for God or not. Christians can choose to do God's will or not to do God's will. In a way, there is not much of a choice as Christians are expected to do all of God's will. That is why seeking and finding God's will remains one of the most popular topics in churches and Christian communities around the world. There is no promise of immediate answers. There is a guarantee that we will eventually "come to know." We need to step out in faith to seek and to put into action what we read in the Bible. We will find out more by being more biblically literate. This is one reason why I encourage small groups to keep studying the Bible together. There is no better way than to study the Word together and to learn of different perspectives on how God is leading each individual. In choices, it is not what choices we make but how well we make those choices. Even mistakes can be minimized if we are humble enough to learn and make amends. Remember, not to seek God's will or to do God's will is already a choice. Keep knocking and the door will open. Keep seeking and we will find. Keep asking and we will get the answer. The choices we make inside us are always ours to make. Choose well. Not only that, life is to keep choosing God. That is faith.